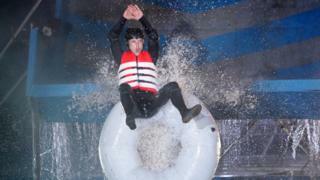 Tens of thousands of adrenaline-junkies have signed up for a UK-wide event, keen to hurl themselves down water slides and belly flop across enormous inflatable balls. Sounds great (if you are into that kind of thing) – but there is a problem. 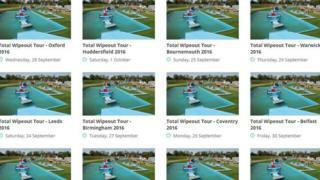 Health and safety aside, it would appear the Total Wipeout tour simply… does not exist. So what is going on? All you have to do is fill in a form and register an interest. Sounds easy enough. But dig a little deeper and the details seem a little woolly. There is no official website for the tour. Venues and dates are “to be announced”. There are no contact details. And a quiet line at the end of the hype says “this has no ties with either the BBC or Total Wipeout”. In addition to having no ties to either the BBC or the production company behind the hit television programme, the tour appears to have no link to the licensing departments of councils where it is claimed the events are to be staged. A straw poll of local authorities; Birmingham City Council, Manchester City Council, Cornwall Council and Wiltshire Council, suggest no temporary event notices have been applied for in respect of the “tour”. Photographs of the apparently fictional event include screenshots from the television series and publicity photographs from several outdoor adventure companies – which have said they have no knowledge of the event. Another suspicious sign is that events are advertised to be going on across the country on the same or consecutive days. Fans on Facebook have reacted in two ways – some are disappointed they will not be able to have a go at the obstacle course. “Oh no – I’d got my hopes up! I was really looking forward to this!” one person said, while another had hoped to arrange a work team-building day bouncing off the water-soaked balls. More commonly, Facebook members metaphorically rolled their eyes. “Some people fall for anything”, “It’s another scam – they just want your details” and “It would be impossible to set up! Think of the logistics!” are all typical responses. So if it is a scam, what is the point? No financial details are requested – most people would regard such a request as a red flag. An email address, date of birth and Facebook profile seem fairly harmless when it comes to opening the door to fraud. But although that information alone cannot be used to plunder a bank account, unscrupulous organisations can still make money from the details. According to the Information Commissioner’s Office (ICO), the incentive could be something called data mining, which is gathering information to sell on to marketing companies. The ICO said before giving any personal information, check a group’s privacy notice to find out what it intends to do with your data. Fake Facebook pages work in two ways: tricking people into liking and sharing a post, then, when the page has a large enough following, selling it on to a business which can change the name, business or product. This is why you may find you “like” a page you have no recollection of ever seeing. Facebook has now disabled the Total Wipeout Tour page.